A Dragon Roost plays a crucial part in all your battles. 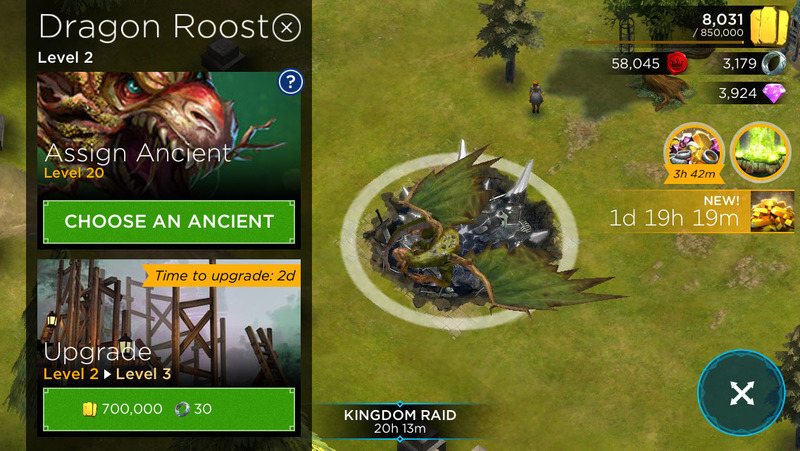 Once you obtain your first Dragon Ancient, you can build the Dragon Roost and assign a Dragon Ancient. 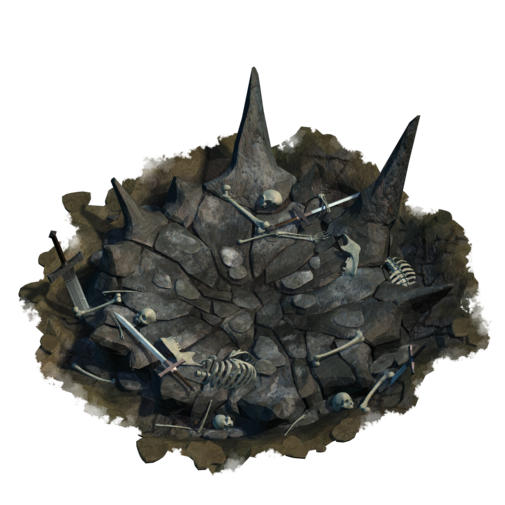 Once in battle, the dragon can be controlled to sweep over the enemy base, causing devastating damage and effects in it's path. 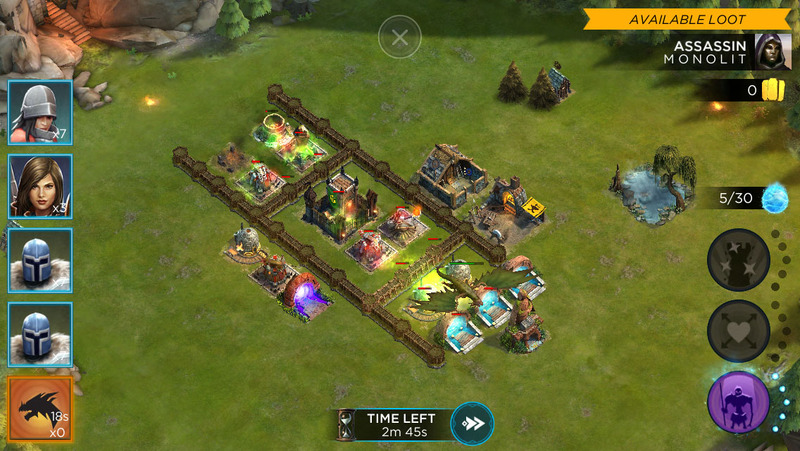 You can obtain Foreveil by completing the "Tracking Foreveil" Campaign from the map. Gryphons may also be assigned to the Dragon Roost. 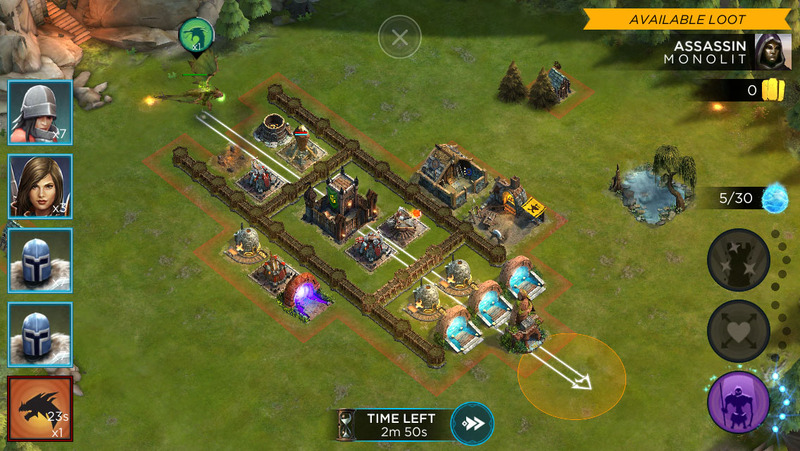 Tapping the Dragon Roost from your village will show the cost to upgrade to the next level, as well as a "Choose an Ancient" button. 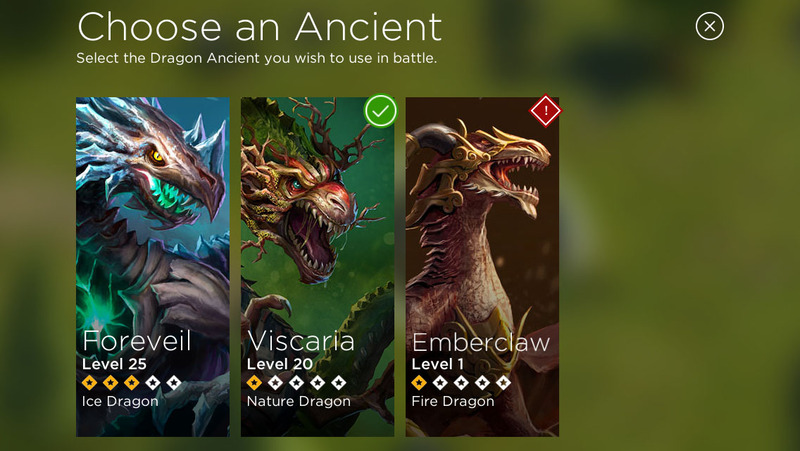 Tapping the "Choose an Ancient" button will bring up a screen with all your discovered Dragon Ancients. You can also tap the "Change Dragon" icon in the bottom left corner on the battle screen, prior to beginning your attack. 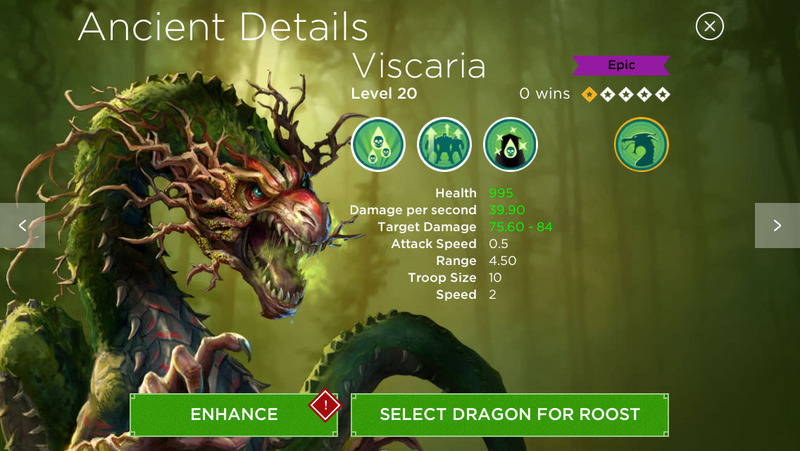 Tapping on one of the Dragon Ancients will reveal it's Dragon Roost stats. 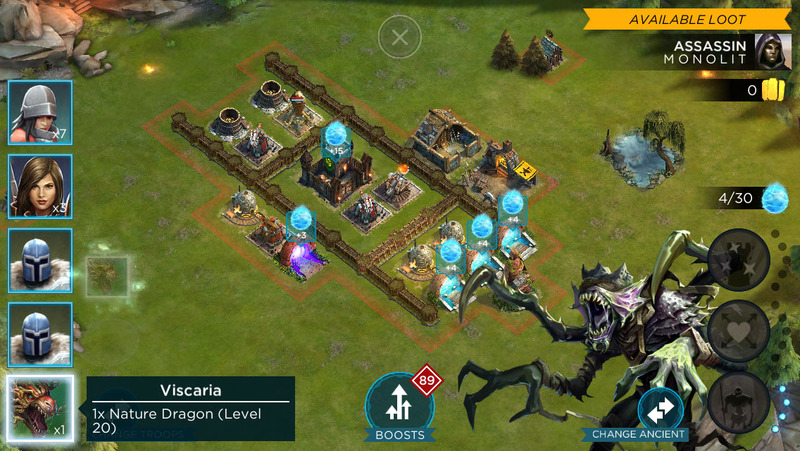 Tap the "Select Dragon for Roost" to select the dragon to be used during battles. You can also tap the "Enhance" button to upgrade your Dragon. See the Ancient Shrine page for details. Health - the health of the dragon during battle. Damage per second - the pro-rated damage rate per second. Target Damage - the actual damage the dragon does per attack. Attack Speed - the number of attacks per second. 0.5 attacks per second would mean 1 attack every 2 seconds. Range - the maximum distance (in tiles) that the Dragon can attack from. Speed - how many tiles per second the dragon can move. Note: You can tap on the Dragon icon for a brief description on it's sweeping ability. The sweep damage is not listed here. 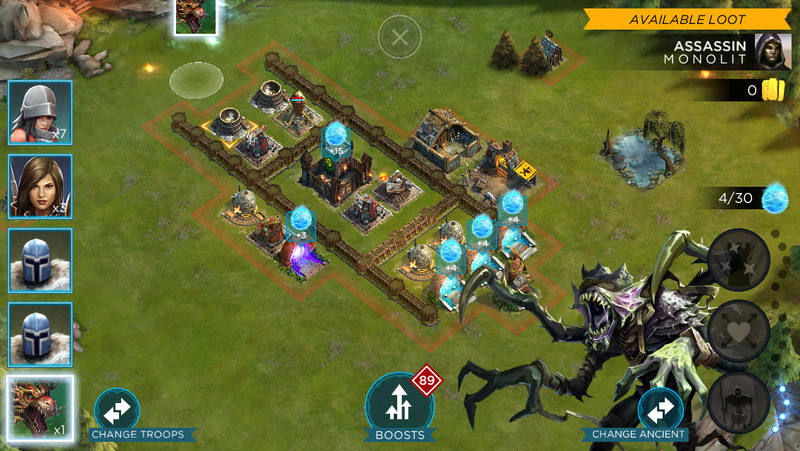 During battle, your selected Dragon will be available for attack in the bottom left corner. Drag and drop the Dragon onto the battlefield. The number in the Dragon box is how many sweeps you have available. This count goes up over time, to a limit of 3 sweeps. To sweep the dragon over the base, hold your finger down on the Dragon box in the bottom left corner (or the icon above the dragon in battle), then release your finger at the desired destination point. Different Dragons have different sweep effects and damage. See the following Dragon and Gryphon Ancient pages for Dragon and Gryphon Power details.